Life sustaining highly specific chemical reactions occur in the confined and organized medium of protein. Our projects aimed at achieving similar selectivity in (photo)chemical reactions explore the use of readily available hosts that bear similarity to biological media. In our laboratory, spatially confined cavities provided by crystals, zeolites, polymers (nafions), and water-soluble cyclodextrins (natural and functionalized), organic hosts, micelles and dendrimers are currently being explored as reaction media. Photophysical and photochemical probes as well as structural tools are generously utilized in our research to define the characteristics of confined reaction cavities prior to employing them as reaction media. Our research interests involving synthesis of organic molecules, X-ray crystallography, solid state NMR, spectroscopic structural tools such as UV, IR and NMR, 2D-NMR, EPR, steady state and time resolved emission spectroscopy, and computational methods provide well-rounded experimental skills to students. Our projects encompassing concepts from currently popular topics such as nano-chemistry, supramolecular chemistry and green chemistry serve to train students in the broader areas of physical organic chemistry and photochemistry. 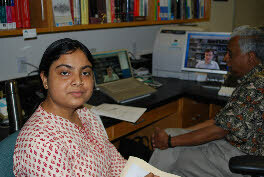 Murthy’s research group usually consists of 6-10 students and postdoctoral associates and the group size never exceeds 10. The smallness of the group allows direct interaction between the student and the teacher. Murthy is readily accessible at any time of the day at office and if needed by phone or email at home. He believes in and encourages direct interaction between the group members and himself. If the project requires external input he arranges for collaboration with experts within and outside the University. Several current projects involve collaboration with groups within and outside USA. When a student joins the group he/she is assigned a small project and at initial stages of up to six months he/she works in association with a senior member of the group. During this time the new member learns the intricacies of functioning in the group such as training to use the instruments in the group and in the department, locating and ordering chemicals and glass-wares, writing reports, presenting talks etc. Once Murthy feels that the student is ready, he/she is assigned a project and is encouraged to work independently. Group activities consist of weekly research discussion, submission of weekly research report, attending weekly group meetings and presenting a talk to the group members once a month on the work in progress or presenting a talk based on published research work. Every student meets with Murthy individually once a week and discusses the work done during the week. At this time, Murthy goes over the individual spectra and data carefully and the student and Murthy decide the strength and weaknesses of the data on hand and plan the work ahead. At this meeting the student submits a weekly research report that serves as the template for discussion. These meetings may last anywhere from 15 min to an hr. Depending on the results additional meetings may be scheduled with the student, other group members working on the same or related project and Murthy. This approach has helped students to be sure that there is some progress every week and also enables him/her to assess whether to continue or abandon the project. Murthy discourages working on a project for a long time without any substantial or hope for any significant results. Students are encouraged to attend conferences that are related to their research work. Given the financial constraints students may aalttend one meeting every two years and present their work either as a poster or as a short oral talk. Attending such meetings provides opportunities to receive comments from experts in the field, meet students from other universities and relate their work with that of other groups. Students are also encouraged to present their work to department weekly visitors and join them for lunch. Such activities allow students gain confidence and learn skills to ‘sell’ their work that is an important strategy for survival in the competitive world of ‘science’. Since students upon graduation are expected to manage their own research, train and teach students or work as a team member in an Industrial environment, Murthy believes that students should be provided an opportunity to learn the intricacies of running a research group. In this context, group members are assigned tasks such as managing and maintaining instruments, cataloging, keeping inventory and purchasing chemicals, disposing waste chemicals, preparing the laboratory for safety inspections, organizing group meetings, assigning journals for literature collection etc. In addition to these, a person in charge of social activities makes sure that the group members feel as being part of a family rather than yet another member of a team.